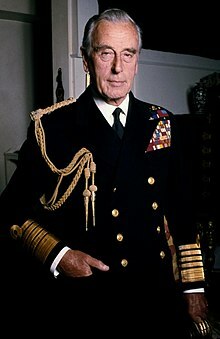 Admiral of the Fleet Louis Francis Albert Victor Nicholas Mountbatten, 1st Earl Mountbatten of Burma, KG, GCB, OM, GCSI, GCIE, GCVO, DSO, PC, FRS (born Prince Louis of Battenberg; 25 June 1900 – 27 August 1979) was a British Royal Navy officer and statesman, an uncle of Prince Philip, Duke of Edinburgh, and second cousin once removed of Queen Elizabeth II. During the Second World War, he was Supreme Allied Commander, South East Asia Command (1943–1946). He was the last Viceroy of India (1947) and the first Governor-General of independent India (1947–1948). In 1979, Mountbatten, his grandson Nicholas, and two others were assassinated by a bomb set by members of the Provisional Irish Republican Army, hidden aboard his fishing boat in Mullaghmore, County Sligo, Ireland.